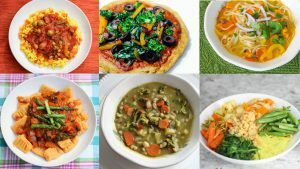 All linked meals are Gluten free and vegan friendly. Eating a restricted diet can be challenging and boring if you don’t venture out and try new recipes or experiment in the kitchen. Out to eat is another story. It can be very isolating to eat out with such a strict diet. There are so many yummy things on the menu for the people you are with to chose from and you can’t even have the veggie burger on lettuce because they put bread crumbs in it. Have you been there? For me, this diet keeps my energy up, my anxiety down, my IBS at bay and my arthritis a thing of the past. So it’s worth the difficulties out to eat and at parties. This is why I create fun meals at home. I’m a foodie and want to experience delicious dishes full of flavor. 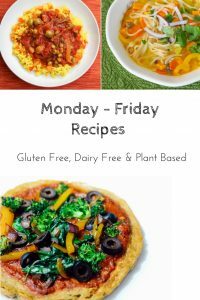 If you have been looking to try more gluten free or plant based meals you will LOVE these! I pulled together a weeks worth of recipes. Many of which you will have leftovers for lunch the next day. Side note: I’m not a big breakfast person (I typically make a shake or have a banana) but here are some ideas for those of you who are: a bowl of fresh fruit, frozen fruit and fresh spinach smoothie or gluten/dairy free bagel with avocado.